With commercial real estate debt maturities still looming large for small businesses and property investors of all sorts, it's encouraging to see the federal government take action that actually helps reduce some of the potential distress. A lot of small business owners struggling to pay off balances (or even meet debt-service obligations) were encouraged when the Small Business Jobs and Credit Act of 2010 enhanced various SBA loan programs - including a provision temporarily allowing borrowers to tap the popular SBA 504 business property finance program to refinance existing mortgages. But as MarketBeat has reported, borrower demand in early months of the program didn't come close to expectations - primarily due to a few prohibitive provisions making lots of otherwise appropriate loans and borrowers ineligible for participation. As a quick reminder for readers who don't live and breathe SBA programs: 504 is the fixed-rate lending program providing up to 90 percent leverage. SBA provides a taxpayer-backed guarantee of the 40 percent loan-to-value tranche (funded through an approved Certified Development Company) that's junior to the 50 percent LTV tranche provided by a senior lender (a bank in most cases). 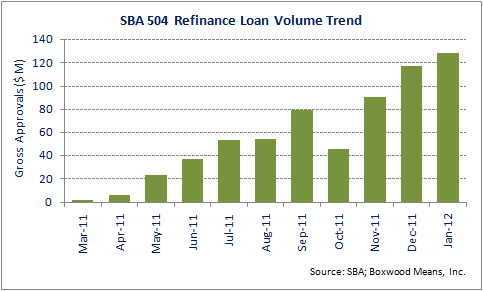 But as the nearby graph makes abundantly clear, borrower demand for 504 refis has taken off since SBA program managers implemented some meaningful tweaks in October. Not only do the latest adjustments open up the program to more eligible transactions, they also help more savvy small business owners secure needed working capital at today's rock-bottom borrowing rates (currently starting in the range of 4.7 and 5.2 percent). Allow senior tranche principal amounts to be less than 50 percent of value as long as they're equal to or greater than the guaranteed 40 percent tranche (allowing for debt-cost benefits of lower leverage). Activity since then demonstrates that, as Stephen Colbert likes to put it, the marketplace has spoken. Before the program adjustments, gross dollar approvals of 504 refi transactions had averaged $60.0 million monthly for the three months ending in October - and $38.2 million for the prior three-month period. The monthly average for the November-to-January period: $112.4 million. "The volume is now increasing every month," observes Kurt Chilcott, who heads big San Diego-based regional SBA lender CDC Small Business Finance. Indeed, gross approval dollars for the 504 refi program jumped 100% from $45.4 million (via 58 transactions) in October to $91.0 million (91 transactions) in November; and has continued rising to $128.6 million (143) in January. A couple of the program enhancements effective in October are clearly helping boost activity, according to both Chilcott and Bob Coleman, publisher of the small business banking Coleman Report. The ineligibility of modified loans had really been problematic, as so many borrowers in good standing simply had trouble meeting rules for verifying that status after all the pooling and other secondary-market trades of mortgages (and related servicing assignments), Chilcott relates. "So now that they've determined that borrowers can show they're current on payments and would have been eligible as the loan was originally funded, we won't worry about" certain documentational minutia, he adds. Meanwhile, the enhancement capping overall loan proceeds at 90 percent of current value, rather than current loan balance, is helping quite a few small business owners refinance all sorts of higher-interest business debt at lower rates - and even secure hard-to-find working capital, Chilcott continues. "There are a lot of owners across the country who still have equity in their business properties - and they're starting to see the value this program can provide in restructuring debt." Chilcott's firm has closed a dozen 504 refis totaling about $33 million (combined senior guaranteed tranches) - the vast bulk since October, with another 15 totaling $27 million approved. Chilcott in fact estimates the refi program is currently accounting for as much as 20 percent of overall SBA funding activity. However even while the small business employment picture also appears to be making reasonably consistent progress these days, Chilcott and Coleman lament that borrowers aren't likely to take advantage of anywhere near the $15 billion capacity allocated to the temporary refi program before its scheduled expiration date (Sept. 27, the two-year anniversary of the jobs act's effective date). "It's a short window at this point; just another four months" before SBA stops processing 504 refi applications, says Coleman. That leaves a huge portion of the allocation untapped - due to both the needed program tweaks and the continued generally skittishness of senior lenders, he adds. A lot of banks are still reluctant to work with even historically successful small business owners who incurred credit impairments in the turbulent wake of the Great Recession, Coleman continues. "So unfortunately it doesn't look like we'll see anywhere near the level of (refi) activity as was originally intended." Perhaps predictably, neither he nor Chilcott hold out much hope that Congress will extend the over-funded program amidst the hard-ball politics typically seen in an election year. "If you think about it we really won't even get a full year" of activity after the deal-stimulating October changes, Chilcott is quick to point out. "So if it really doesn't cost any more, why not extend it if the need is there - and we're certainly going to see challenges given all the $5 million-and-under CMBS loans set to mature through 2014 and 2015."